Planck’s discovery of a bridge of hot gas connecting the clusters Abell 399 and Abell 401, each containing hundreds of galaxies, represents one such opportunity. The presence of hot gas between the billion-light-year-distant clusters was first hinted at in X-ray data from ESA’s XMM-Newton, and the new Planck data confirm the observation. 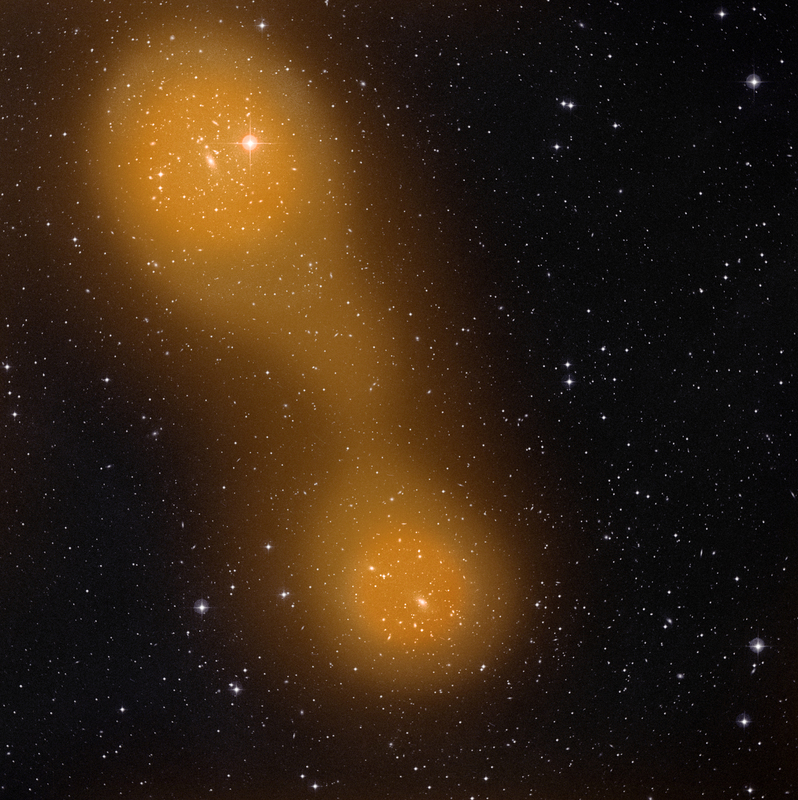 It also marks Planck’s first detection of inter-cluster gas using the SZ effect technique. By combining the Planck data with archival X-ray observations from the German satellite Rosat, the temperature of the gas in the bridge is found to be similar to the temperature of the gas in the two clusters – on the order of 80 million degrees Celsius. Early analysis suggests the gas could be mixture of the elusive filaments of the cosmic web mixed with gas originating from the clusters. A more detailed analysis and the possible detection of gas bridges connecting other clusters will help to provide a more conclusive answer. The new finding highlights the ability of Planck to probe galaxy clusters to their outskirts and beyond, examining their connection with the gas that permeates the entire Universe and from which all groups of galaxies formed. This entry was posted in Galaxies, Satellites and spacecrafts and tagged cluster, galaxies, planck by Thomas. Bookmark the permalink.